When I present my models on church growth I invariably refer to the process by which a person joins, or starts attending, a church as their conversion. Like the words “believer” and “unbeliever” this often causes some discussion with people, and various suggestions for renaming the conversion process as join, or recruit, etc. The latter are perhaps less threatening as they indicate an outside view of the process, rather than a comment on the inner state of a person’s heart. Nevertheless I stand my ground, and it usually gets me into trouble! I realise a word like “conversion”, can comes as a threat. The King James translation of Matt 18:3 says: Except ye be converted, and become as little children, ye shall not enter into the kingdom of heaven. And Acts 3:19: Repent ye therefore, and be converted, that your sins may be blotted out. Pretty blunt stuff! Unless something happens – you are lost. Of course modern translations have eliminated “convert” and replaced it with “turn” or “change”; no doubt more literally correct, but perhaps lacking the profundity of what is required. 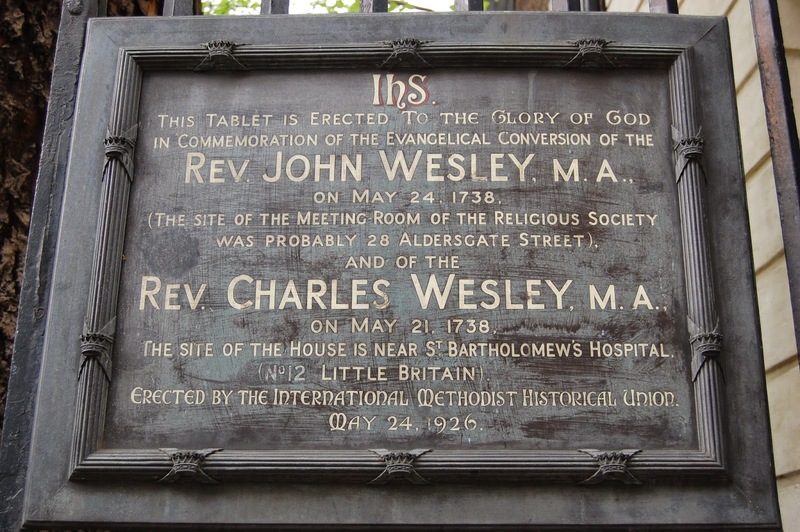 Although he does not use the word “conversion” here, this event has been described ever after as the moment of his conversion, as stated in the plaque at the spot in Aldersgate Street, figure 1, figure 2. Certainly his journal entry has all the hallmarks of conversion: “change which God works in the heart”, “trust Christ alone for salvation”, “taken away sins”. 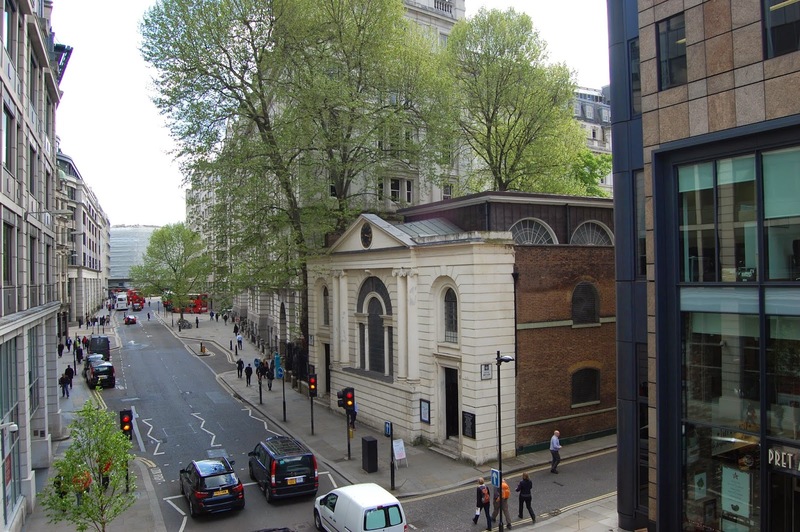 This journal entry is displayed outside the London Museum on Aldersgate Street, figure 3. 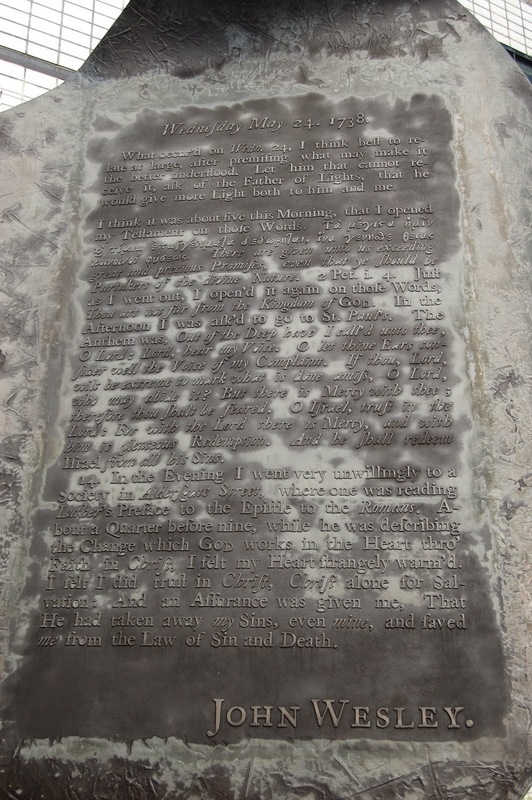 What is more controversial about John Wesley’s conversion is that he was already baptised, confirmed, an ordained minister, been doing works of Christian charity and had even conducted evangelistic campaigns in America. He wrote in his journal January 24 1738: I went to America, to convert the Indians; but oh! who shall convert me? Clearly he believed that even being a minister was no proof of a person being converted. However, as I hope to show, this is not how I use the word “conversion” in church growth models. The meaning of “conversion” depends on the interpretation of “believers”, which in turn depends on how the number of believers are measured. For most models two measures are used: either the number of regular attendees at church, using the definition of “regular” relevant to that church; or the number of members of the church, again using the church’s definition of membership. If attendance is used, then “conversion” means those start attending in a given year. They are converted in the sense that their Sunday habit has changed. If membership is used then it is their willingness to identify with a church that has changed. They have publicly changed their identity. Clearly these meanings are not the same as the theological view, which sees conversion as an inner change in the heart. This inner change can happen to church attendees, or church members, not just unbelievers. Thus there may well be unconverted people, in the spiritual sense, in the stock of believers; John Wesley would have been one. Indeed there could be spiritually converted people in the stock of unbelievers, though hopefully only for a temporary period. There is no attempt, or intention, in the church growth models to model the change in numbers of spiritually converted people; it would be impossible to gain the data necessary to validate the model. Indeed because church people mix together in a different way to the way they mix with those outside church, the system dynamics model of figure 4 would be rendered too simplistic for spiritual conversion. Yet there are two senses in which “conversion” is a good word to use for the flow. Firstly, the word “conversion” refers to something instantaneous, which is necessary for a flow. Louis Berkof states: conversion in its most specific sense denotes a momentary change and not a process like sanctification. It is a change that takes place once and that cannot be repeated. That is very much the essence of a flow in system dynamics, events that occur at a moment in time. Indeed it is measured as “people converted per year”, but could equally be “people converted per second”, it is that instantaneous. Of course “seconds” would not be very appropriate as most people cannot pin down the time of their conversion that clearly. It is much easier for people to decide which stock they are in, Unbeliever or Believer, than to give the time at which the change occurred! If instead of using the word “convert” the expression “start attending” were used, then this does not carry the same instantaneous sense, because of the interpretation of regular attendance. Many people start attending gradually; it is an ongoing process, not momentary, thus not a good name for a flow. Likewise “recruit” can be an extended process, in this case carried out by the church through campaigns and the like. “Join” can be treated as instantaneous, the act of having one's name put on a book. But, as the second reason will show, it sends out the wrong message. There is a second, and more important, reason why “convert” is better than “join”, or “recruit”. The word “convert” leaves open the agency of that change. “Join” implies the agency lies with the person joining – their choice, whereas “recruit” emphasises more the agency of the church in bringing it about – they went out and got them! I have always intended my church growth models to be as broad as possible, modelling the choice to take up religion by unbelievers, achieved through the action of the church in evangelistic campaigns and witness, empowered by outpourings of the Holy Spirit, or revivals, where the emphasis is on God’s agency in the conversion. If the model tries to tie down the agency in the change from unbelievers to believers too much to any of these three, then it will restrict the understanding and application of the model, and worse, restrict the approach to dealing with church decline. There are three components in conversion: the demand side of human agency, activities of the unbelievers in their conversion such as believe, commit, repent; the supply-side of human agency, preaching, evangelism, persuasion; and the Holy Spirit’s agency, the divine-side, new birth, conviction, new life, opened hearts. A model that so ties down the agency as to rule out one or more of those sides is too restrictive. It will set up model boundaries that are narrow and reduce the ability to draw conclusions. An example of this restrictive thinking came about recently in an article in Future First  about the perception UK society has of church, Christianity and the like. Not surprisingly the less connected people were with church the more negatively they viewed it, Christians and the things of Christianity. The article ended by saying that it was deeply troubling that the church’s message of grace appeared to be masked by a perception of judgmentalism, anti-homosexuality, hypocrisy and being old-fashioned. The writer concluded by saying that the church had much to do to change perceptions and present the unique selling point that no-one else offers, the grace and love of God. Despite being an interesting and well-researched article, the conclusion to me appears to be too narrow, that the church’s lack of growth results from the way the church presents itself. The focus of the solution was all on the supply of religion by the church, which is inadequate because of the image it portrays. The advice was that the church needs to change its image to one more in tune with society. This is a solely supply-side solution because the problem is perceived as supply-side, the barrier set up by the church to those who wish to join. It has left out the demand-side, that the people’s perception is negative because the people outside need converting! They demand the wrong things. It has left out the divine-side, as it needs God to warm their hearts as much as he did with John Wesley! Indeed if the church proclaimed its real unique selling point: the death and resurrection of Christ, I would expect there to be more unbelievers with a negative perception of church. The natural man does not receive the things of the Spirit of God, for they are foolishness to him, 1 Cor 2:14. The unbeliever may have no problem with the grace and love of God, many religions have this, it is not unique to Christianity – but it makes no demands. On its own, it reduces church growth to one of “attract and recruit” rather than “persuade and convert”. The grace and love of God are in the context that people need conversion, the change which God works in the heart through faith in Christ, as John Wesley said. God’s grace and love provided the means to carry this out, historically on the cross, and effectually in the heart by the Holy Spirit. This is why I always use the word “convert” in my models. They need to encapsulate the three sides of the process of moving from unbelievers to believers: the message the church must supply, which may well incur hostility; what must change in unbelievers’ demand, the desire for God on his terms; and the work of God which matches the demand with the supply – demand for salvation in Christ. I like to think that my models can proclaim the gospel as well as model church growth! Perhaps modern translations of scripture are translated by academics and scholars, whereas the Authorised/King James version and its immediate precursors was translated by evangelists and pastors? Just a thought! Berkoff L Systematic Theology, p.485, Banner of Truth, 1988 edition. There will of course be people who cannot decide which of the two categories they belong to. It would be easy to invent a third category Don’t Know and connect more flows. However as the model is counting membership or attendance then an unsure category is not usually required. Will Bissett, Perceptions of Those Outside the Church, Future First, No. 34, Brierley Consultancy, August 2014. ISSN 2040-0268.